RVA - The three-time World Series champion San Francisco Giants have announced the 2018 field staff for their Double-A affiliate, the Richmond Flying Squirrels. 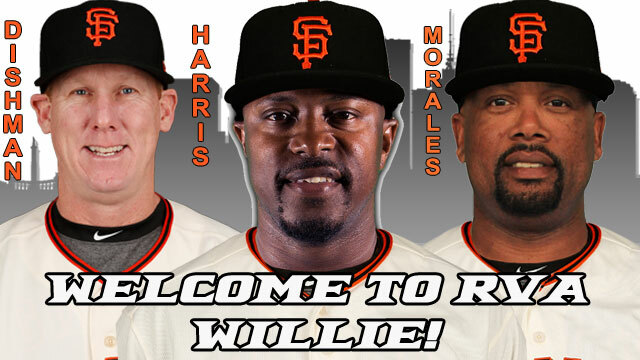 Former Major League utilityman and 2005 World Series champion Willie Harris will lead the Flying Squirrels for the 2018 season. Harris enters his first year in the San Francisco Giants organization and will become the seventh manager in Flying Squirrels franchise history. Harris appeared in 1,046 games over the course of his MLB career and spent time with the Baltimore Orioles, Chicago White Sox, Boston Red Sox, Atlanta Braves, Washington Nationals and New York Mets. Harris will be joined on staff by pitching coach Glenn Dishman, hitting coach Francisco Morales, Special Assistant Gene Clines and bullpen coach Eliezer Zambrano. The 2018 athletic trainer will be Hiro Sato, while the strength and condition coach will be Jonathan Medici. Harris, 39, becomes the seventh manager in Flying Squirrels history and the most accomplished former MLB player to take the reins. Harris appeared in 1,046 games over the course of his 12-year MLB career, spending time with the Baltimore Orioles, Chicago White Sox, Boston Red Sox, Atlanta Braves, Washington Nationals and New York Mets. The Georgia native famously scored the lone run in Game 4 of the 2005 World Series, clinching the first title in 88 years for the Chicago White Sox. Harris led off the eighth inning of Game 4 with a pinch-hit single and scored the eventual winning run on a Jermaine Dye base hit. Harris gathered 580 hits and 107 stolen bases during his tenure in the Majors. He spent three seasons (2008-2010) with the Washington Nationals, playing in a career-high 140 games for the Nats' in 2008. Of his 1,046 career MLB games, Harris played 409 in a Nationals uniform, more than any other team he suited up for. Prior to his tenure with the Nationals, Harris spent a year playing for the Atlanta Braves organization and appeared in 17 games for the Triple-A Richmond Braves at the beginning of the 2007 season. In just a short time of calling The Diamond home, Harris snagged seven bases and hit a robust .362 (21-58). His hot start in Richmond prompted a promotion to Atlanta and on April 30, Harris appeared in his first game as a Brave. He went on to play in 117 games for Atlanta, hitting .270 with 17 stolen bases. On July 21, 2007 Harris went 6-6 at the plate against St. Louis, becoming just second Atlanta player to record six hits in a game, joining Felix Milan in the history books. Harris connected on two triples, drove in six and scored four runs in the standout performance. Harris began his coaching career in 2016 with the White Sox system as a hitting coach with the Great Falls Voyagers in the Pioneer League (Advanced Rookie League). Under his tutelage, the Voyagers batted .280 (5th) and swatted 53 home runs, fourth most in the league. The 2016 Voyagers also displayed significant patience at the plate, leading to a team .365 on base percentage (3rd). In 2017 Harris was promoted to manager of the Winston-Salem Dash, the Advanced-A affiliate of the White Sox (Carolina League). In his first season at the helm, the Dash finished with a 56-83 record. The Dash hit .263 as a team (3rd overall) and were caught stealing just 21 times, fewest in the Carolina League. Harris replaces 2017 Squirrels manager Kyle Haines, who has been promoted to Assistant Director of Player Development. Dishman, 47, enters his third season in the San Francisco organization and his first with the Flying Squirrels. The former MLB pitcher spent the past two seasons in the Arizona Rookie League and helped guide the AZL Giants to the Championship Series in 2017. Under Dishman's tutelage, the AZL Giants posted a 3.96 ERA (5th), while striking out 525 batters (3rd). Dishman replaces Steve Kline, who has been assigned to Triple-A Sacramento. Kline previously held the role of pitching coach for three seasons. Dishman's coaching career began in 2004 when he joined the staff at Ohlone College in Fremont, CA. The Dodgers then added Dishman to their coaching ranks the following year, beginning a stretch of seven seasons in the Los Angeles system. From 2005-2011 Dishman made stops as the pitching coach for the Columbus Catfish (2005), Vero Beach Dodgers (2006), Great Lakes Loons (2007, 2015), Jacksonville Suns (2008), Chattanooga Lookouts (2009) and the Albuquerque Isotopes (2010-2014). Dishman began his professional playing career as a member of the San Diego Padres organization in 1993. The lefty was initially signed as an undrafted free agent out of Texas Christian University and assigned to Short Season Spokane where he complied a record of 6-3 with a 2.20 ERA over 12 starts. Dishman reached Double-A Wichita In 1994 and was a Texas League All-Star with the Wranglers. He replicated the All-Star duties the following year in Triple-A Las Vegas and made his MLB debut on June 22, 1995 for the Padres. During his rookie campaign, Dishman appeared in 19 games (16 starts) and finished with a record of 4-8 and a 5.01 ERA. He appeared in three games the following year with San Diego and was eventually picked up on waivers by the Philadelphia Phillies. In 1997 Dishman appeared in seven games for the Tigers before falling back out of the Major Leagues. In all he appeared in 33 MLB games (21 starts) and worked 135.1 innings over three seasons. Morales, 44, joins the Giants organization after having spent three years on staff in the San Diego Padres system. The former Minor League catcher was the hitting coach for the San Antonio Missions (Double-A, Texas League) in 2014 and made his managerial debut in 2015 with the Fort Wayne Tin Caps (Low A, Midwest League). In 2016 Morales briefly took over as manager for the Lake Elsinore Storm (Advanced-A California League). The Dominican Republic native began his post-playing career as a bullpen catcher and staff assistant with the Cleveland Indians organization. He got his start as a coach in 2005, when the Arizona Diamondbacks pegged him as an instructor in the Dominican Summer League. As a player, Morales spent parts of eight seasons in the Minor Leagues with the St. Louis Cardinals, Chicago Cubs and Montreal Expos before spending four seasons playing in the Independent Leagues. Clines joins the staff having spent the past two years within the Giants organization as a Special Assistant, Player Development. The former MLB outfielder enjoyed a 10-year Big League playing career with the Pittsburgh Pirates, New York Mets, Texas Rangers and Chicago Cubs (1970-79). Clines' playing career was highlighted by three trips to the postseason with the Pirates (1971,1972 and 1974), including a World Series title in 1971. He had his best season in the Majors with the Pirates in 1972, batting .334 in 107 games. Clines has an extensive coaching resume that began as a first base coach with the Chicago Cubs following his final year as a player in 1980. He spent six seasons as the San Francisco's hitting and outfield coach (1997-2002), and has also has served as the hitting coach with the Milwaukee Brewers (1994-95), Seattle Mariners (1989-92) and Houston Astros (1988). Prior to retuning to the Giants organization, he spent nine years working for the Los Angeles Dodgers as a Senior Advisor in Player Development. Drafted by the Pirates in the 6th round of the 1966 draft, Clines made his MLB debut on June 28, 1970. He appeared in 31 games his rookie season and helped lead Pittsburgh to a World Series title the following year. Clines batted .308 for the '71 Pirates and stole 15 bases in 300 plate appearances. Clines connected on a solo home run the fifth inning of Game 2 of the NLDS against San Francisco. He also appeared in three World Series games against Baltimore, going 1-11 with a triple. The Flying Squirrels don't know what a baseball season would be like without the veteran catcher Zambrano, who will transition into a coaching role in 2018. Zambrano, "The Original Squirrel" has been a mainstay of the team and community since the club's inception in 2010, and is the only Flying Squirrels player to appear in a game in all eight seasons of the club's existence. The man also known as "Z", has totaled 691 plate appearances in 216 games in his Flying Squirrels career and 447 games overall. The 12-year MiLB veteran was initially signed by the Giants as a non-drafted free agent on Feb. 9, 2005. In addition to his contributions on the field, Zambrano has volunteered for the Flying Squirrels in countless community appearances, kids camps and events. Hiroki Sato begins his first year as an athletic trainer with Richmond after spending the 2017 season with the Augusta GreenJackets (Low A, South Atlantic League). Prior to his time in Augusta, he spent three seasons with the Arizona Rookie Giants. Before his arrival in the Giants system, Sato spent one season in the Los Angeles Dodgers system working at the rookie ball level. During the 2014-2015 season, he served as the head athletic trainer of San Juan Senadores during the Liga de Béisbol Profesional Roberto Clemente in San Juan, Puerto Rico. Sato earned a bachelor's degree in Athletic Training from Grand Canyon University in Phoenix, AZ and another bachelor's degree in Physical Education from International Budo University in Chiba, Japan. He received his M.S. from California University of Pennsylvania. He began his interest in professional baseball as an undergraduate intern (PBATS& JBATS) with the Seattle Mariners, San Diego Padres, and Texas Rangers while attending Grand Canyon University. He is a member of the NATA, NSCA, and NASM. Sato has been in the United States for 10 years, arriving from his hometown of Oita, Prefecture of Japan." Jonathan Medici begins his first season as strength and conditioning coach for the Richmond Flying Squirrels. 2018 marks his second year in the San Francisco Giants organization, previously holding the same title with the San Jose Giants (Advanced-A California League). Medici also served as the physical performance coach for the Modesto Nuts in the Colorado Rockies organization during the 2016 season. The Flying Squirrels operate at The Diamond year-round. Season tickets, mini plans and group packages are currently available by contacting the front office at 804-359-FUNN (3866). The Flying Squirrels annual Charity Hot Stove Banquet is scheduled for Jan. 25 at the Siegel Center and tickets can be purchased here.